Analysts in an enterprise environment usually have to deal with data from a multitude of sources. One of the most prevalent is SAP BusinessObjects and while it does provide enterprise level capabilities to IT it might not provide all the capabilities analysts require. The analyst wishing to leverage the powerful visualization and storytelling capabilities of Tableau in these companies had to go through the tedious process of requesting extracts from the IT/BI department. This can now be mitigated with an SAP Business Objects – Tableau Connector. By using SAP’s own BusinessObjects SDK we can access BO Universes and pass the structure through a gateway into a format that Tableau can reuse. It allows everyone to design new workbooks based on new universe queries without the need of WebI reports or Query-as-a-WebService endpoints. For free and open source. The WDC connection essentially generates a user interface that is familiar from SAP BO so the learning phase should be instantaneous – from here the basis of any number of analyses can be generated and further refined in Tableau. A Windows machine that has SAP BO XI 4.1 Client Tools and has the SemanticLayer SDK from the Developer options installed. 3. Extract the required universes’ metadata and move them to the WDC proxy location. This process will extract the universe metadata like measures, dimensions and details from the repository and store it as a JSON file. For more help check out this help file. 4. Start the WDC proxy and connect it to using Tableau Desktop’s Web Data Connector option. This will manage CORS proxying along with the business logic. I have an another, more lightweight connector for BusinessObjects Web Intelligence (WEBI) reports or QaaWS (query as a web service) queries. You can read more about that here. Using legacy BI tools like IBM Cognos or SAP BusinessObjects from Tableau helps a lot. Eliminating the need to manage the semantic layer two different places not just make the server more manageable and secure but also reduces the cost of maintenance. If you have questions or wanna ask help for try this out in your environment just drop a mail or leave a comment! Hi, I’ve followed the steps to extract the metadata, install all of the pre-requisites, environment variables and configuring the xml. And when I try and run BOMetadataExtraction.bat, it produces the following in the command prompt before closing with an error that I can’t read in time. https://uploads.disquscdn.com/images/7aacae487412de507cf931f590bb30d389a8ccc6ba03ff70aeb82ac7fd80fede.jpg. These warning messages are normal. Can you try to run the command from a cmd.exe to see the actual error messages? Hi Tamas, thanks for getting back to me. I’ve run in cmd.exe and attach is a screenshot of the errors. can you make sure that this server can see the internet directly? 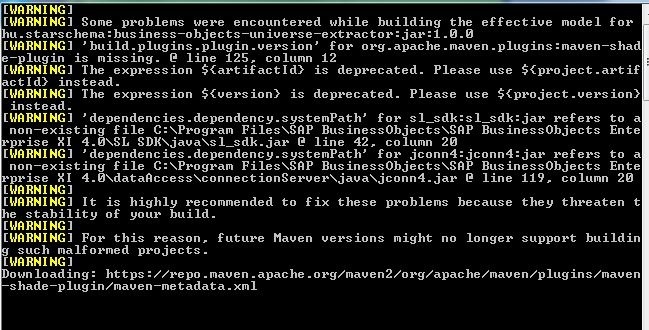 I’ve found that it gets a bit further if I specify the version number in the POM.xml for maven-shade-plugin with version 3.1.0. 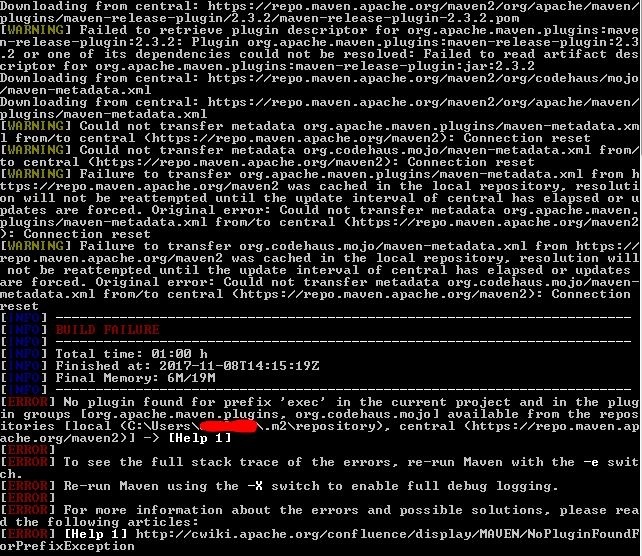 It does seem to be downloading these as I can see them in the .m2 repository, but with each download is the warning ‘Failed to retrieve the plugin descriptor for or one of its dependencies could not be resolved: Failed to read artefact descriptor. Hi Tamás, is this still working? Do you have any commercial product to recommend?